Henderson Island is an uninhabited uplifted coral island in the south Pacific Ocean, known for its bird life and untouched phosphate reserves. All four land bird species are endemic to the island (Henderson Crake, Henderson Fruit Dove, Henderson Lorikeet and Henderson Reed-warbler). There are also fifteen non-endemic seabirds. Other endemic species include nine plants (of the sixty-three species on island), four land snails (of sixteen species), and one butterfly (only species on island). 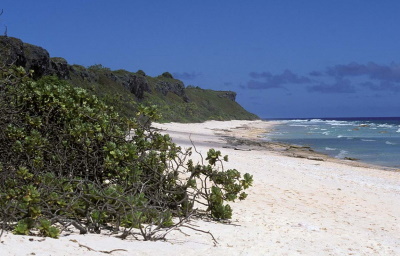 Formerly inhabited islands: has archaeological remains of Polynesian settlement plus the occasional shipwrecked sailors/castaways!